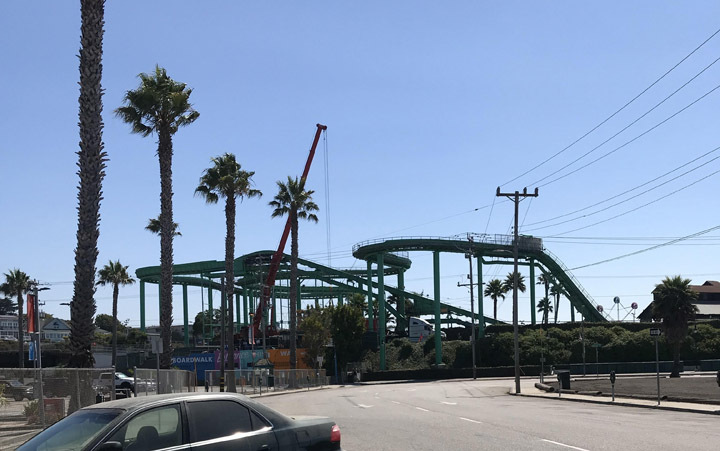 Park News - (2/22/19) Special thanks to a local area reader for sending in a picture of the new Crazy Surf ride now installed at Santa Cruz Beach Boardwalk. (11/28/18) While we haven’t heard much about what Santa Cruz Beach Boardwalk is planning for the 2019 season, a local source tells us that the Undertow coaster is currently being repainted. (9/10/18) According to one source, while the Crazy Surf is being removed from Santa Cruz Beach Boardwalk, they were told the plan was to replace it with another unit. If true, I'm not sure what happened to the old one to get it to the point where the replacement option was cheaper than repairing the existing one. Maybe they just got a lemon or something... anyone know more if it had a history of downtime and frequent issues? (9/7/18) A reader sent in a photo of the Santa Cruz Beach Boardwalk where a crane was on site removing the Crazy Surf ride. Not sure why, or what might replace it, but Crazy Surf was just installed back in 2012. (3/21/18) Santa Cruz Beach Boardwalk has confirmed that after 60 years, their iconic Ferris Wheel will not reopen this season, and the wheel itself will be removed sometime next week. They say they are looking into all options to replace it, possible with another wheel, or possibly with an entirely different attraction. ???? - Expand Undertow Deck - Rumor - Fitting in with the 2017 plans to replace the 2-story Frightwalk / Arcade / Laser Maze building with new single story buildings are rumors about expanding the second story attraction deck that currently is home to the Undertow coaster to eventually cover these new single story buildings and allow for the construction of more new attractions space on the second level. The timeline for this project is unknown at this time.